Winter weather and ice on the ground mean salt and sand, and the City Ranger 2250 salt and sand spreader is perfect for the job. Its clearing width is the same as i.e. dozer blade or snow sweeper, so snow is cleared first, and then the salt or sand is spread. The clearing width of the salt and sand spreader can be increased, up to five metres if needed, which is highly effective when gritting parking areas or fighting freezing rain. The salt and sand spreader is funnel-shaped so that salt, sand or gravel is pressed down by its own weight. Even wet material flows freely. A stirrer prevents clotting and a vibrating plate in the bottom drives the material down onto the spreader plate for the correct spreading width. A new version of the spreader enables the stirrer and the dosing to be adjusted individually, so that you never use more material than needed – to the benefit of both the environment and the operating costs. The amount of material is manually set by the operator. All parts in contact with salt are rust-free. With the new version, however, all parts are rust-free, and there is an extra sealing between machine and attachment to protect machine and engine against salt and dust during gritting. 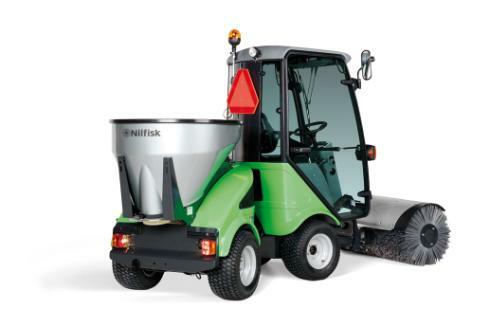 Due to a large volume and a low load height, the salt and sand spreader is easy and quite accommodating to work with. It runs far on one filling, and the start/stop function ensures spreading only when the machine is moving.